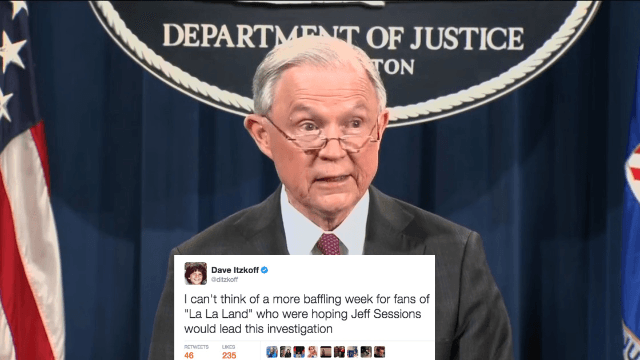 Twitter piles on Jeff Sessions for his not-quite-apologetic press conference. Attorney General Jeff Sessions' integrity came into question because he was personally opposed by Coretta Scott King when The Washington Post revealed that he indeed had meetings with the Russian ambassador, despite testifying before Congress that he didn't. He said, under oath, “I did not have communications with the Russians,” making that phrase the new "I did not have sexual relations with that woman." Even Republicans know that this is a big deal, with some calling on him to recuse himself from the Trump-Russia probe. Some Democrats are calling for his resignation. Sessions held a presser on Thursday and announced that he's recusing himself from the Russia investigation, before ducking out early. You got the phone alerts, now here are the tweets. i won’t be happy until Jeff Sessions recuses himself from all public life. Why did Jeff Sessions wait until he was caught to decide he had a conflict of interest? SESSIONS to reporters: "It's good to be with you." Presser scheduled for 30 minutes. Sessions clocks out 8 minutes early as the qweschins get hard. In fairness, we should put Sessions's dishonesty in the context of his long and distinguished career as Attorney General. Sessions this afternoon: "I have recused myself..."
✅ "we meet a lotta people"
It's a terribly crucial quality 4 any lawyer to have a sharp & vivid memory. Now that Sessions has changed his story 1000x in half a day and admitted to what he lied about, but not the lying, this'll surely blow over. Seinfeld: So are you gonna recuse? Seinfeld: You can't refuse to recuse! [voice gets higher] No recusal refusal! "How many times did you talk to the Russian ambassador?" Sessions sounds like a bad sketch actor playing a racist. Sessions in short: I said something false that was true. so Sessions will pass off to his subordinate an investigation that might end up affecting Sessions? I'm no lawyer, but I've seen enuf tv shows to know #Sessions said too much and just made things a lot worse for himself. Drip drip drip.